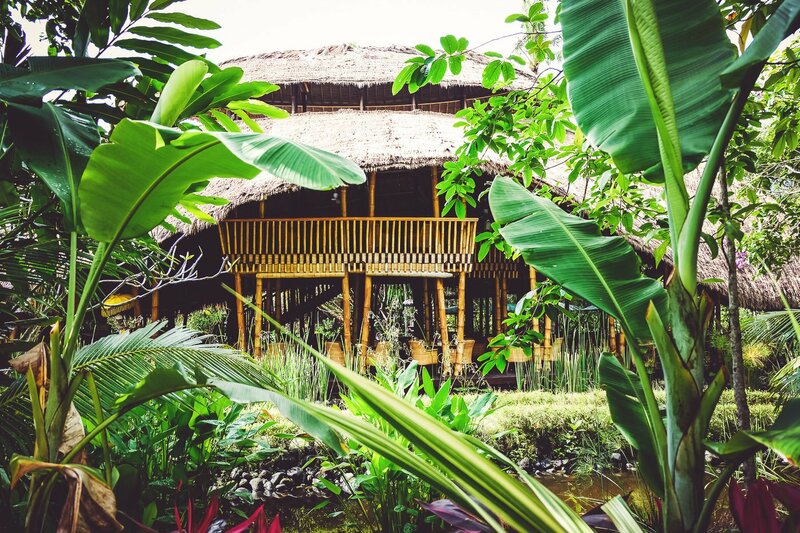 This award-winning healing and wellness retreat has won over 30 awards and is located directly on the sacred Ayung River, just outside Ubud. 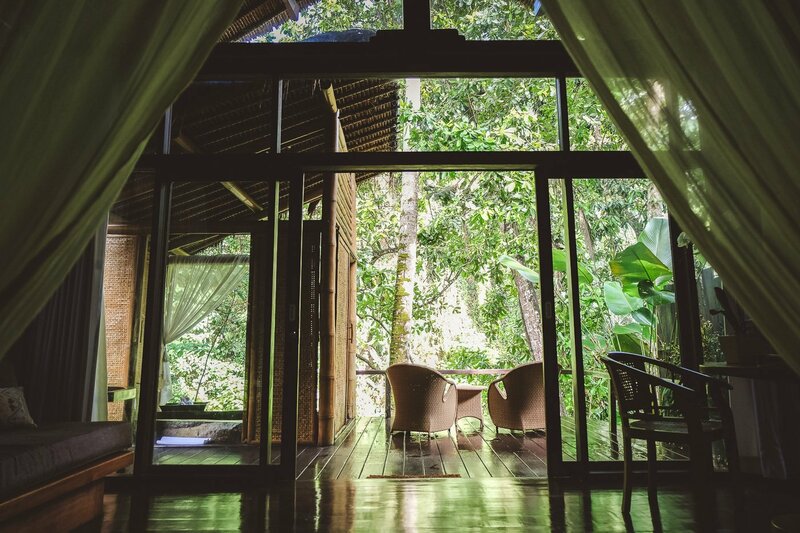 Surrounded by beautiful nature, you can stay in one of nine luxurious and romantic suites and spend your days relaxing and recuperating with a variety of spa and healing treatments. 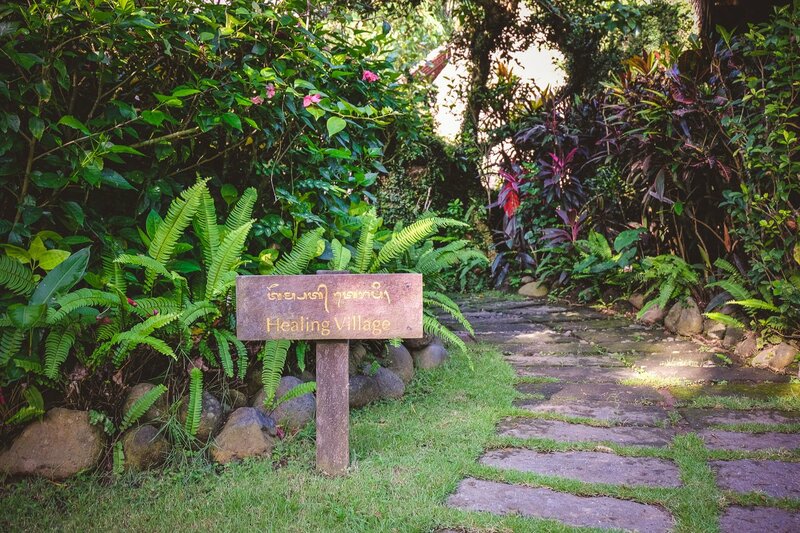 Guests from all over the world come here to take advantage of the retreat’s healing therapies. 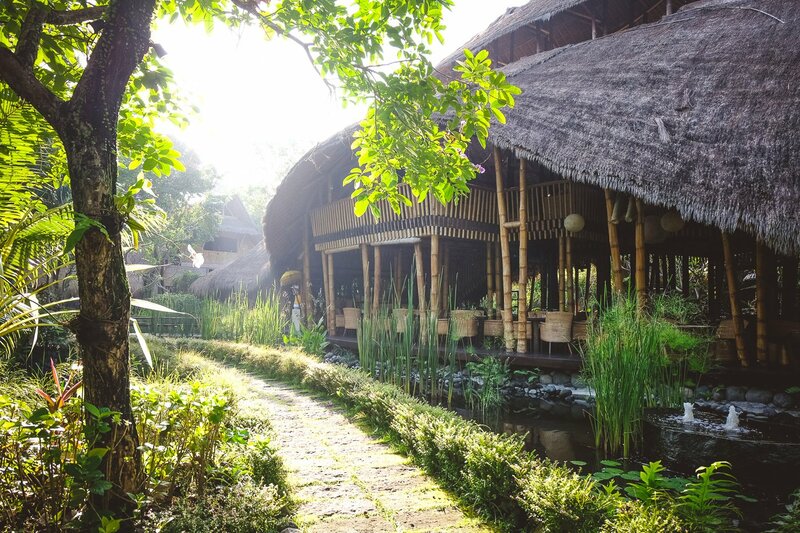 The eco-friendly retreat was opened in 2010 and is built like a small Balinese village. 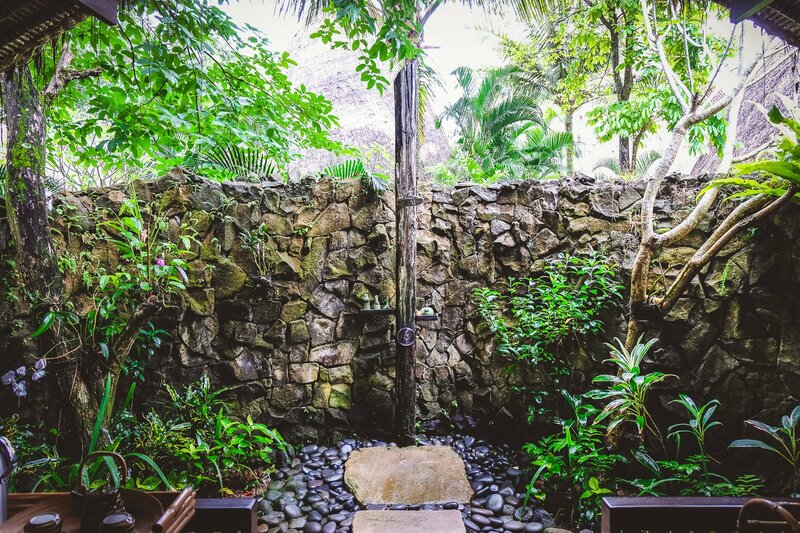 Even when it is fully booked, you are still surrounded by perfect tranquillity. 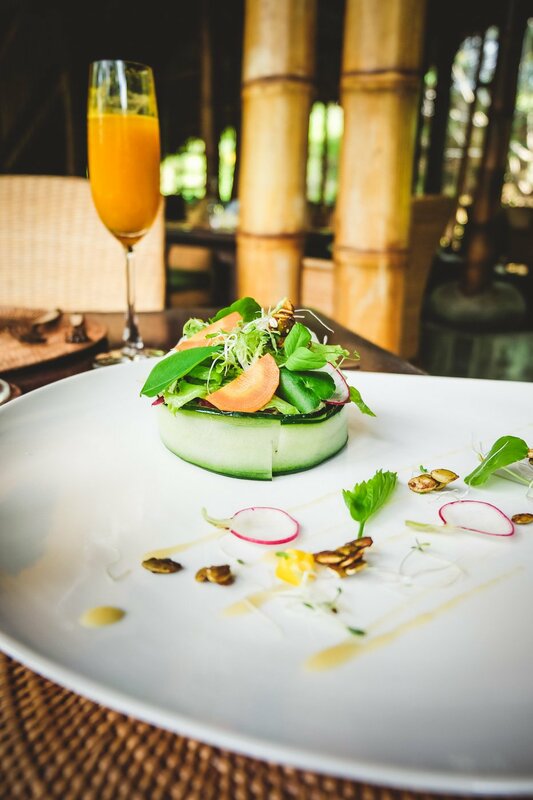 It is the ideal sanctuary to escape the stresses of modern day life, eat healthily and take care of your body and soul in an environmentally conscious surroundings. 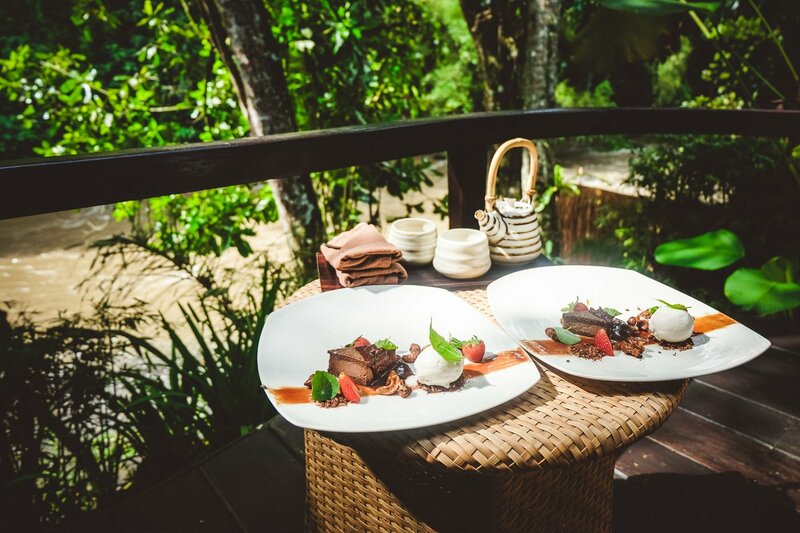 Perfect for a romantic getaway and for taking some time out to focus exclusively on healing and well-being. 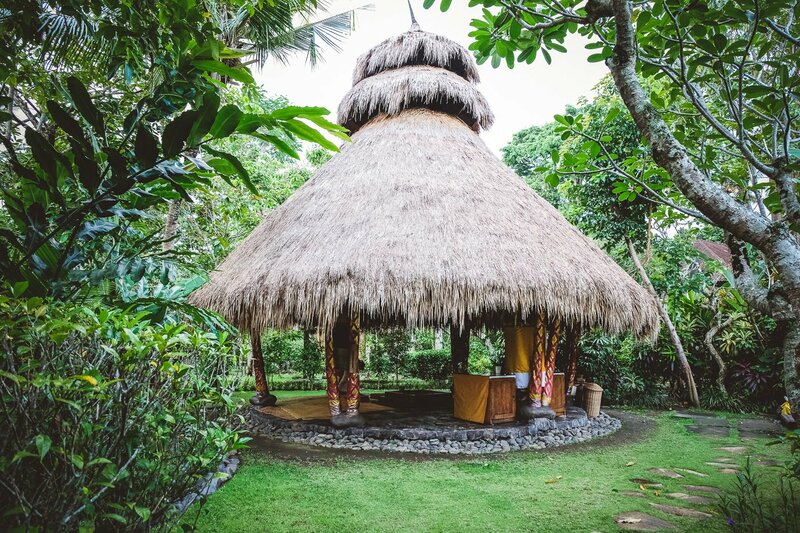 The retreat offers customized healing programs, blessings and rejuvenating spa therapies inspired by the ancient Balinese wisdom of releasing negative energy and harmful toxins from the body, mind and soul. 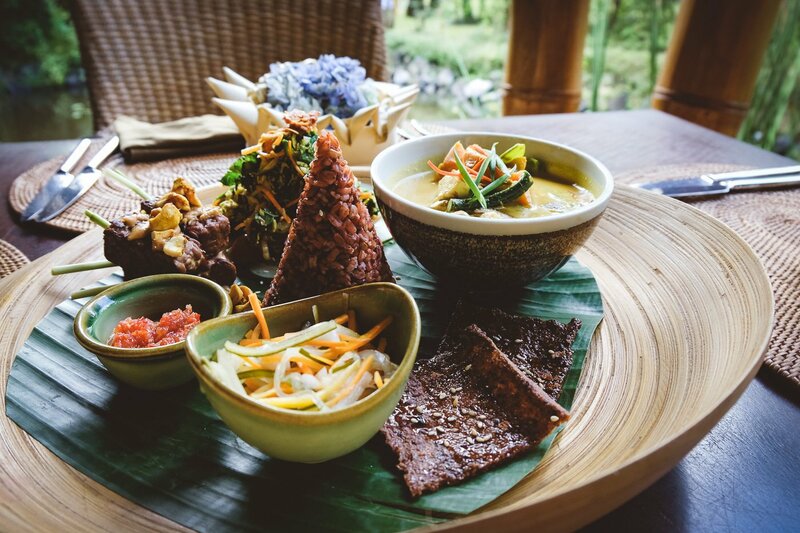 As part of the holistic healing experience, menus are inspired by living raw foods and sacred art practices such as meditation, martial arts and yoga are offered. 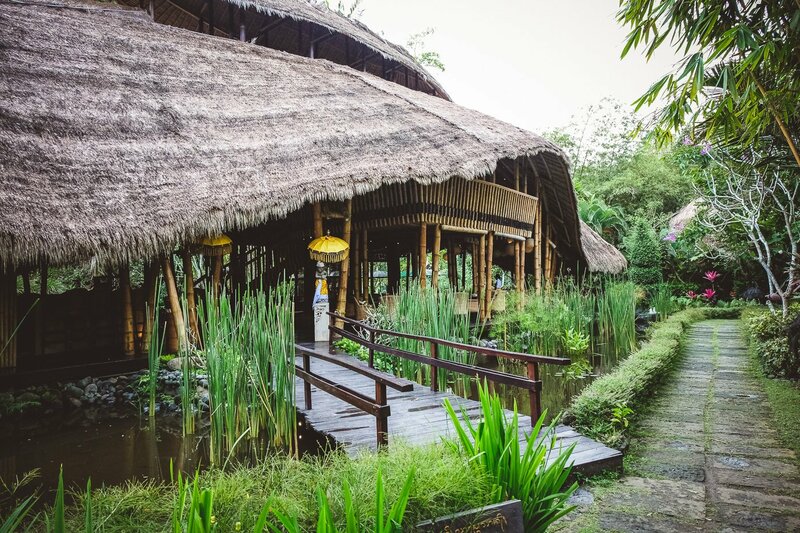 The retreat aims to raise health and well-being to a whole new level. 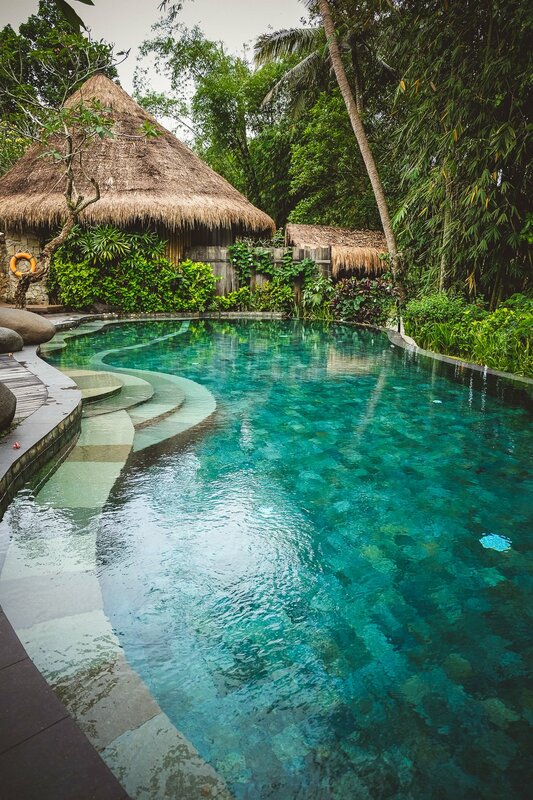 The large pool and heated hydrotherapy pool for Watsu water therapy sessions ensure complete relaxation. 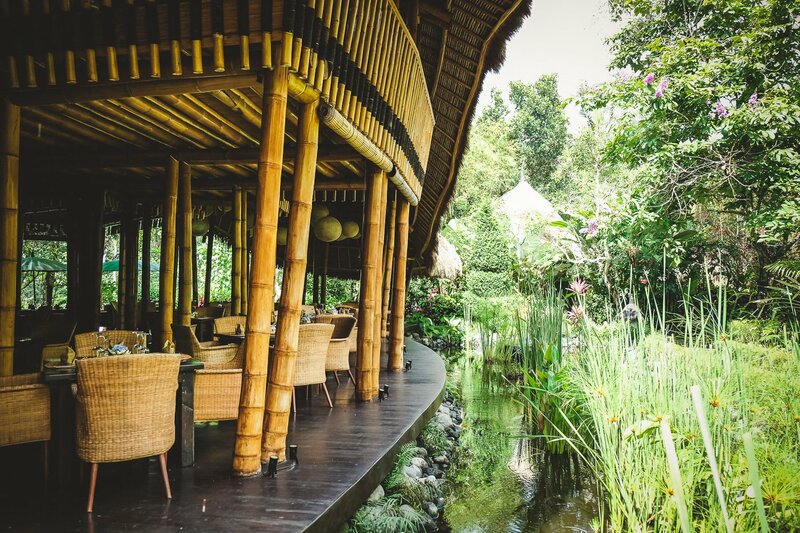 The Sakti Dining Room with its spectacular bamboo architecture is set in the midst of tropical gardens and koi ponds. 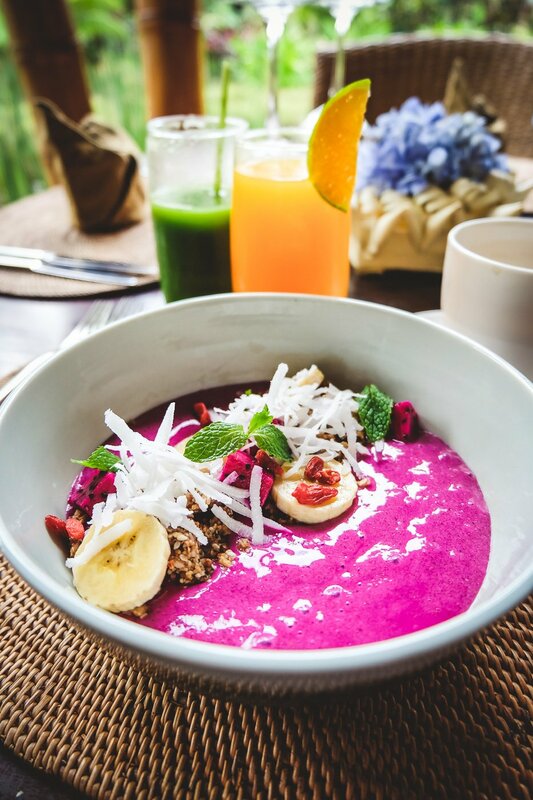 The kitchen is dedicated to providing high-energy and innovative healing with its “Living Foods” concept, which includes raw vegan food and other easy-to-prepare, plant-based dishes. 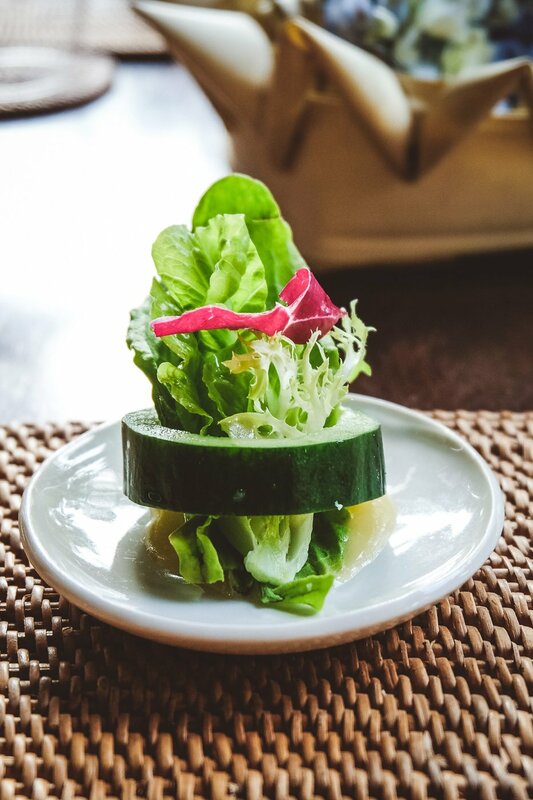 The menu includes vegetarian soups, dahls, super-food salads, delicious raw desserts, fresh juices and smoothies. 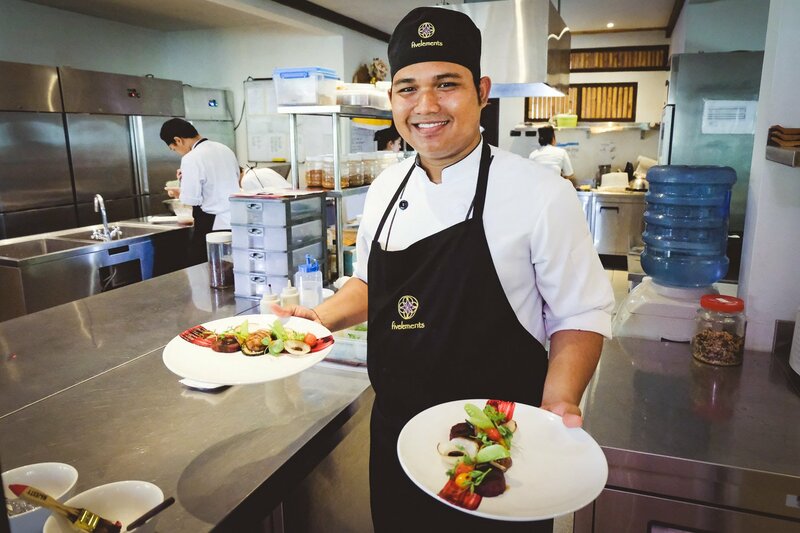 With its vitamin and nutrient-rich kitchen, the restaurant has already won countless awards. 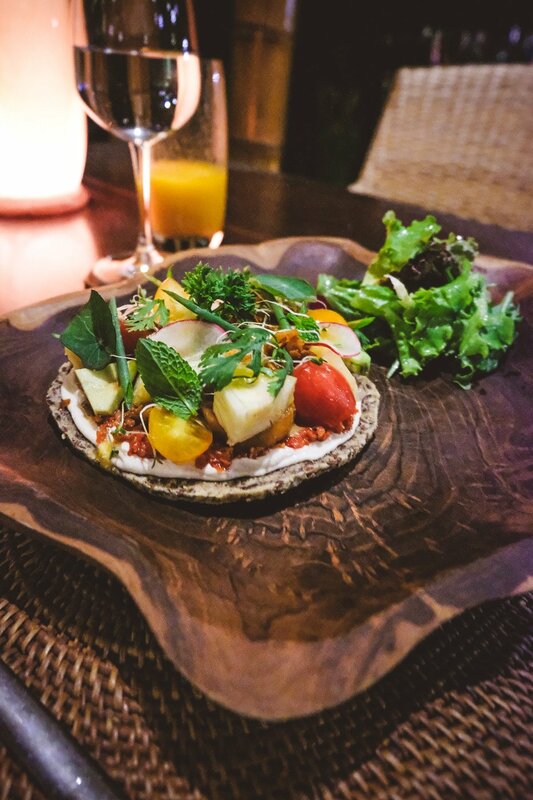 We never thought that vegan food can be so tasty. 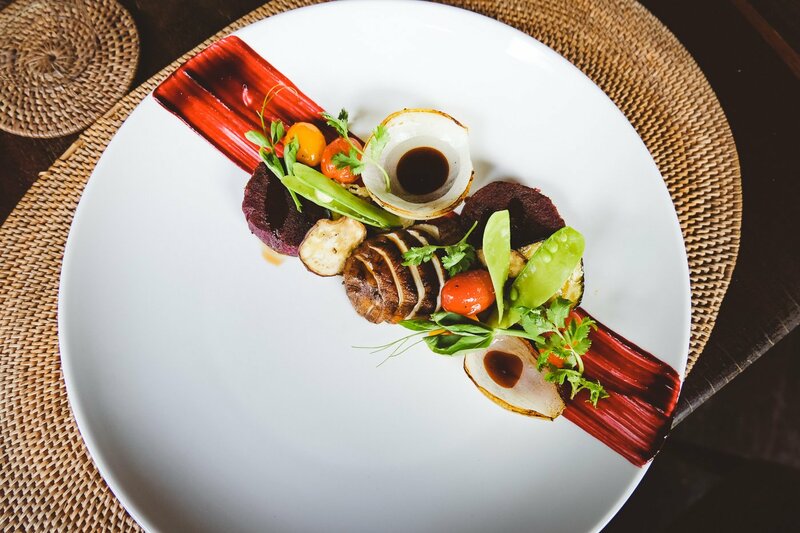 But that it was – one artwork on a plate after the other and all so yummy! 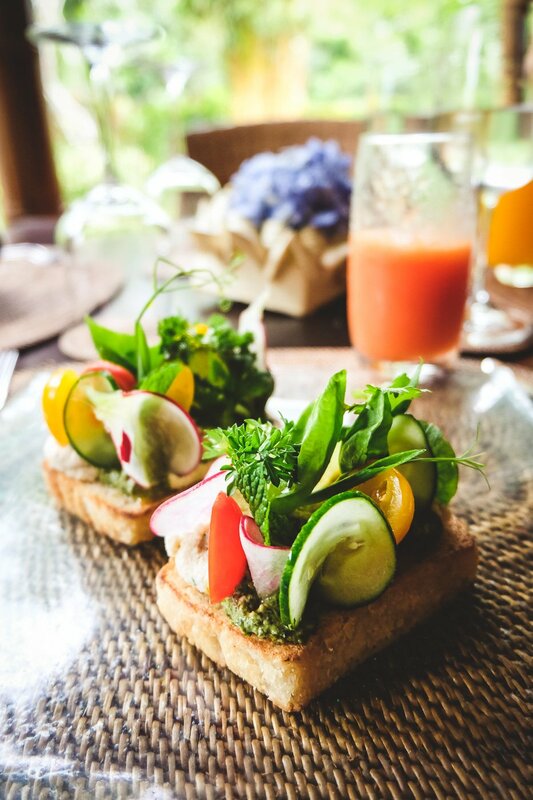 Organic vegetables from the local garden are mainly used and the retreat supports local farmers and sustainable agriculture. 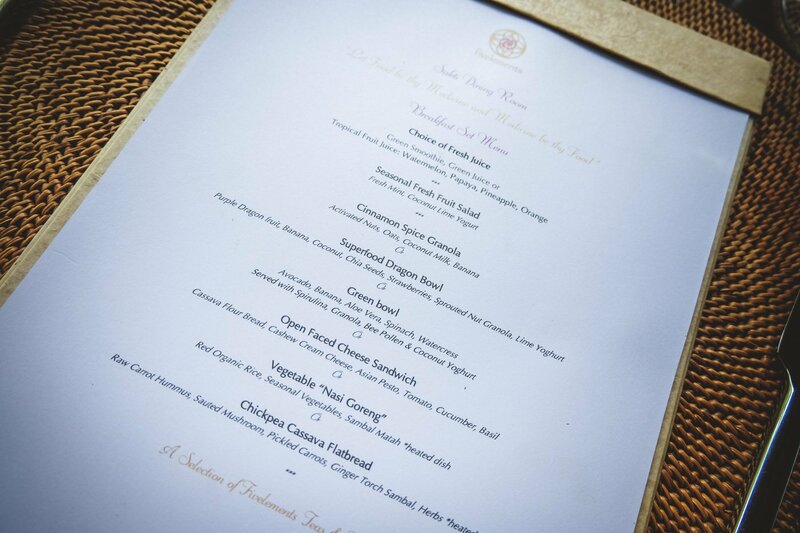 The chef’s specialty tasting menus for lunch and or dinner with 3-, 5- or 7-course meals, are highly recommended. 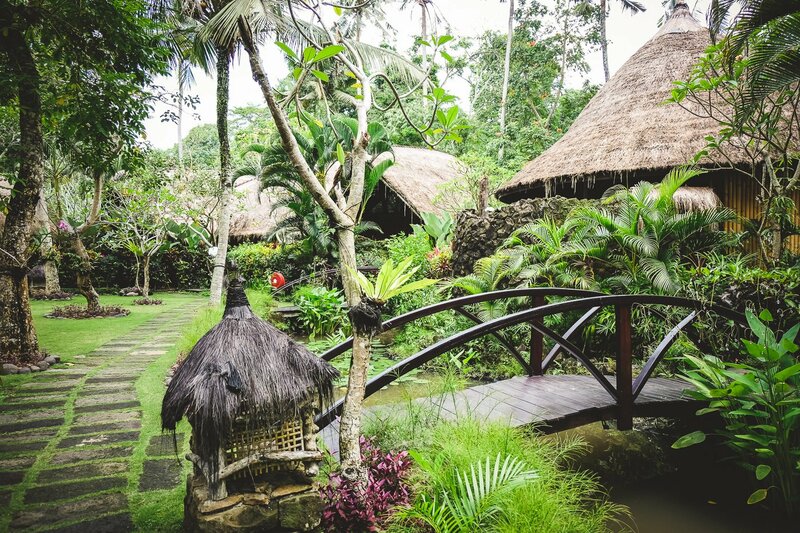 The distribution of the nine luxurious suites resembles that of a small village and they blend harmoniously into the tropical environment. 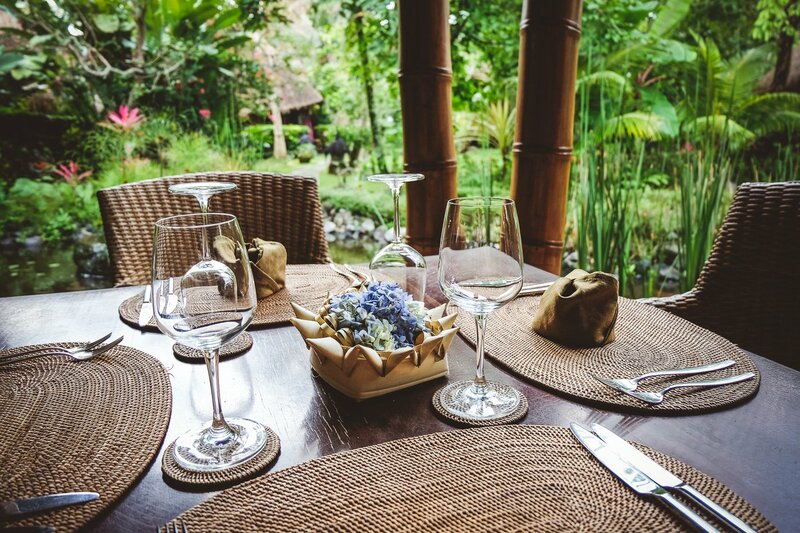 They offer spacious, airy wooden verandas with beautiful views of the lush green landscape, waterfalls and the river. 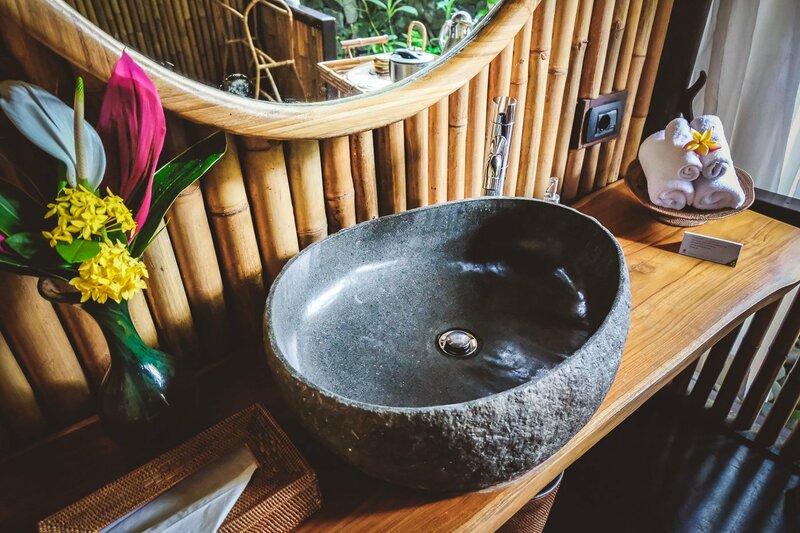 The cozy bamboo suites have high ceilings, huge glass fronts, a sofa corner, recycled wooden floors, stunning open bathrooms with massive volcanic stone bathtubs on its own terrace. 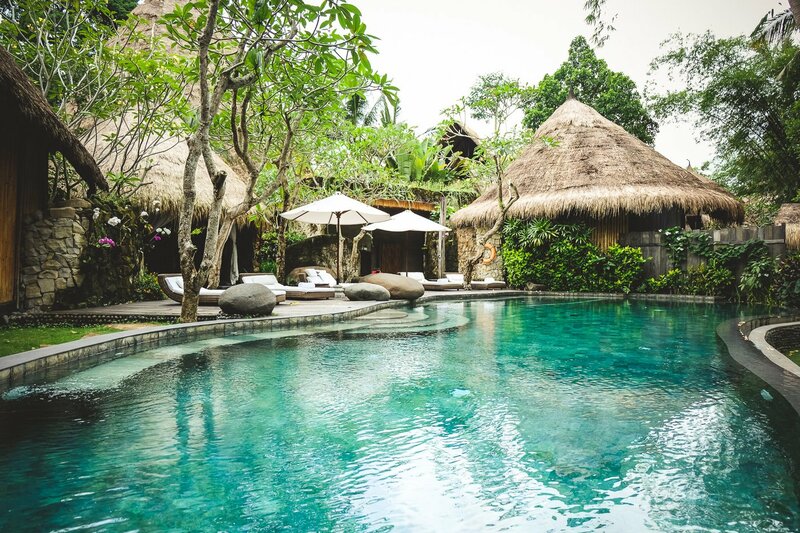 Some of the villas also have their own private pools. 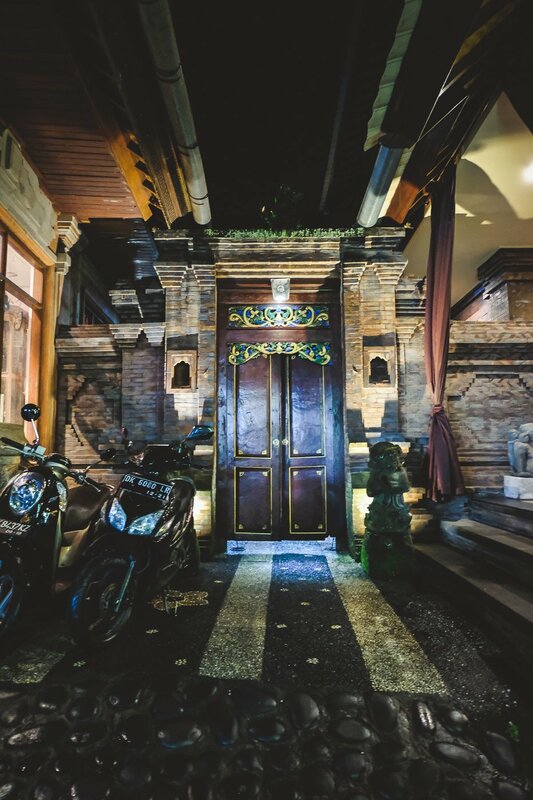 The suites are named after the five elements: Pertiwi (earth), Apah (water), Teja (fire), Bayu (air) and Akasa (space). 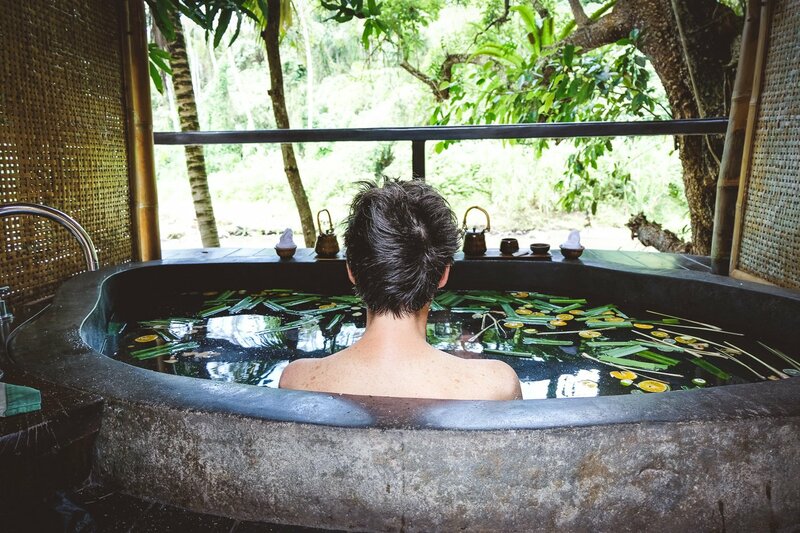 The bath products are made from natural ingredients by local farmers. 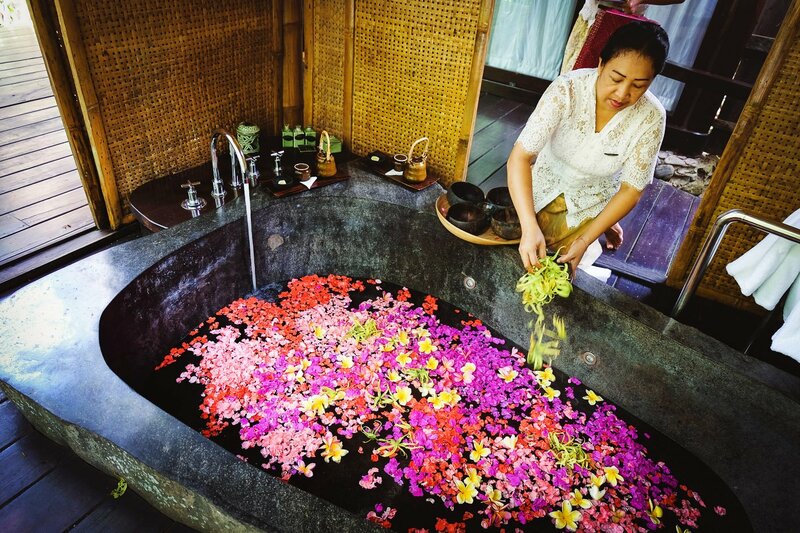 If you would really like to treat yourself, you can even order a pampering flower bath at the spa. 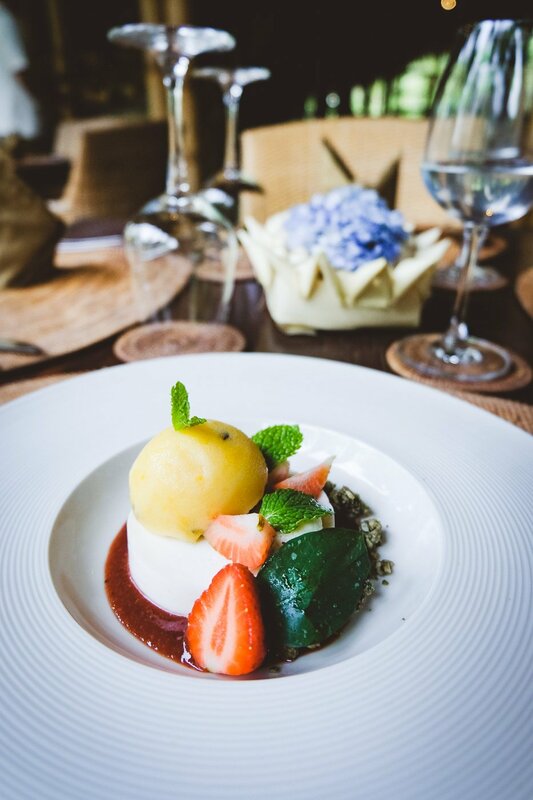 Afternoon tea can also be served in your suite as the terrace offers impressive views of the river. 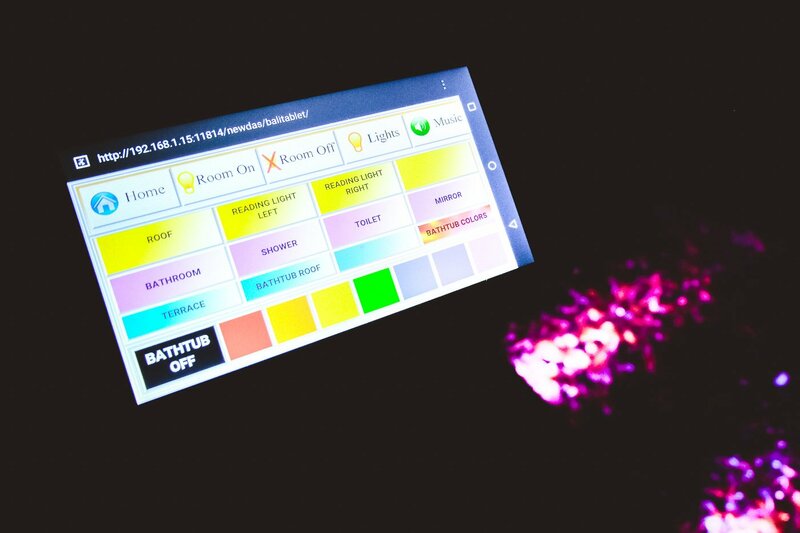 The lighting is controlled by the use of an iPad and for example, allows for color therapy lighting in the bathtub in the colors of the seven chakras. 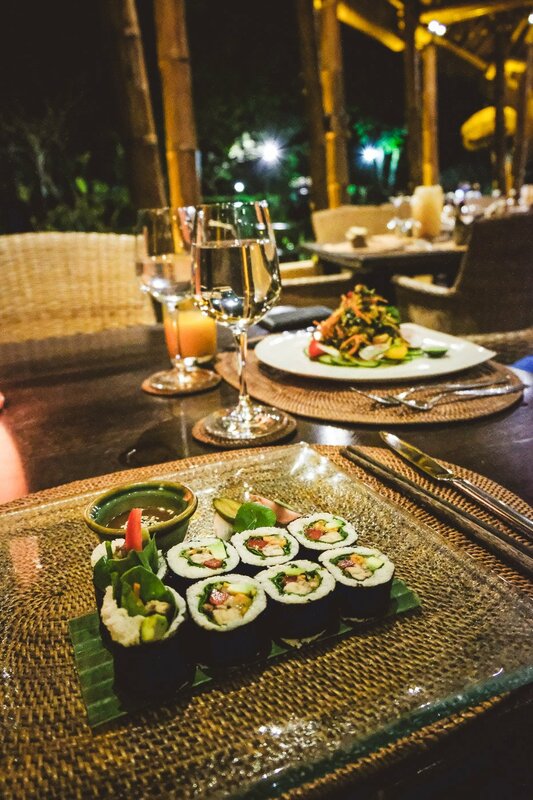 Especially romantic in the evening! The Fivelements promotes sustainability and environmental protection in many ways. 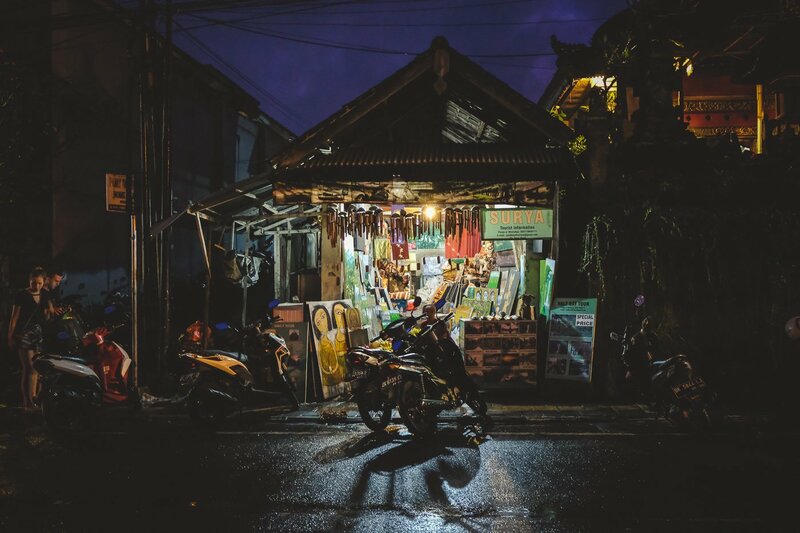 For example, the use of LED lighting saves 95% in electricity and the use of environmentally friendly ventilation fans saves about another 50%. 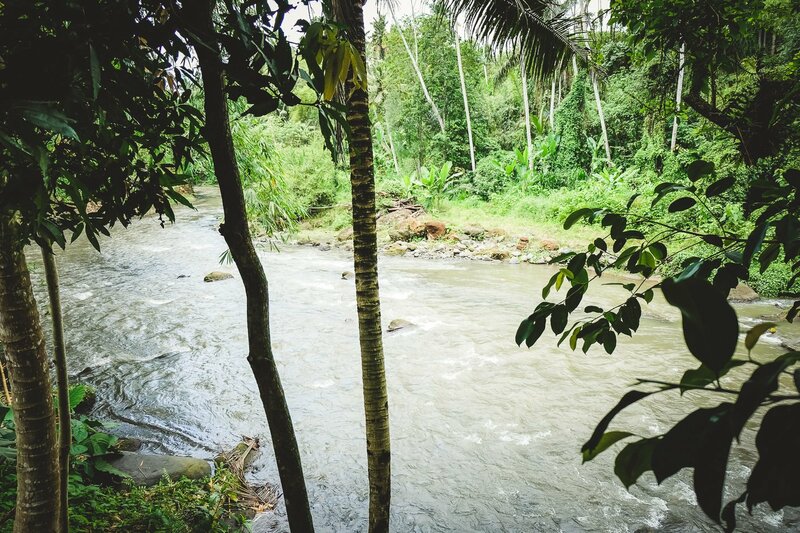 The vast gardens are irrigated with rainwater and grey water is treated and recycled. 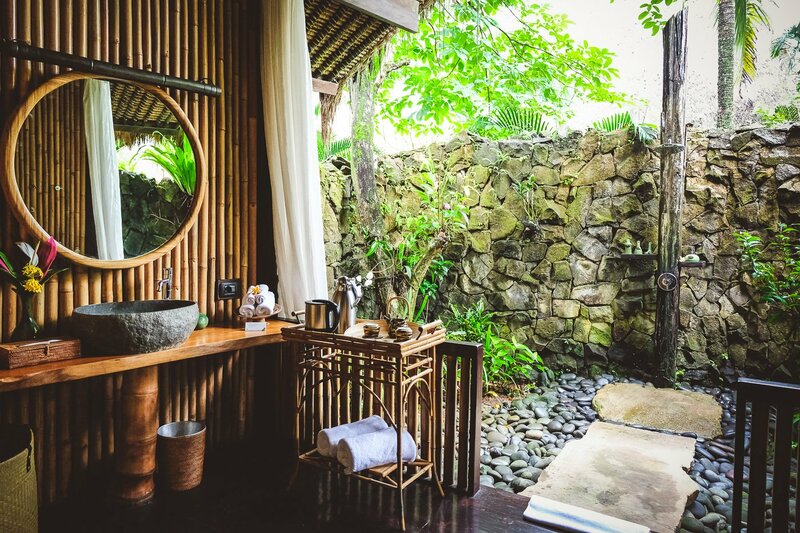 The beauty salon offers detoxifying body scrubs, relaxing aromatic baths, facials, manicures or pedicures. 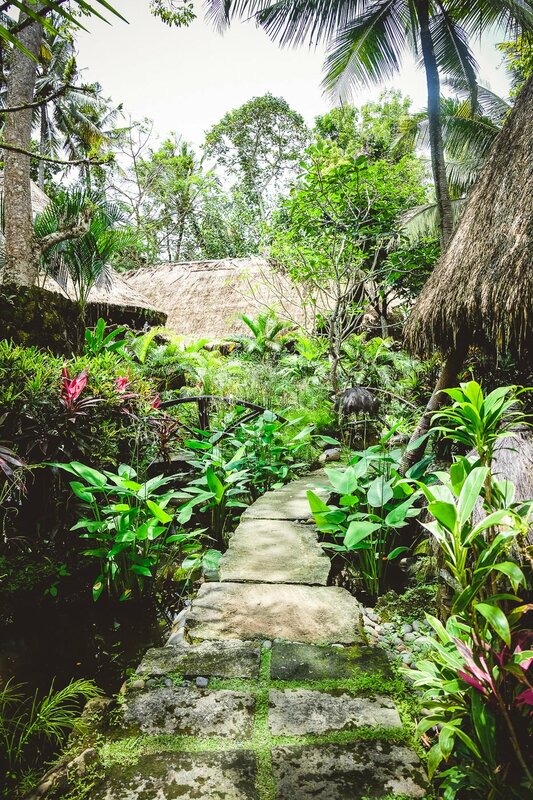 All beauty and spa products use natural medicinal plants and organic super ingredients. 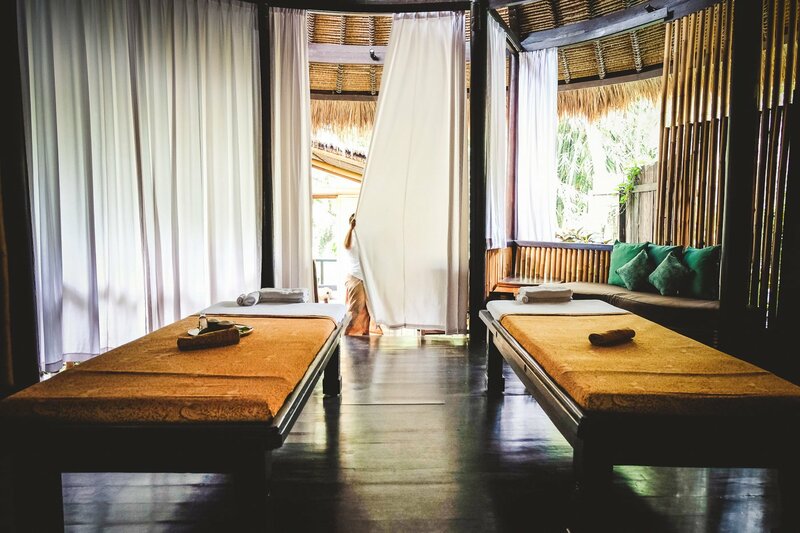 This is a wonderful ritual to indulge in, especially for couples and it includes a footbath, followed by a deep muscle relaxation body massage and a remineralizing crystal sea salt scrub with healing basil and lemongrass. 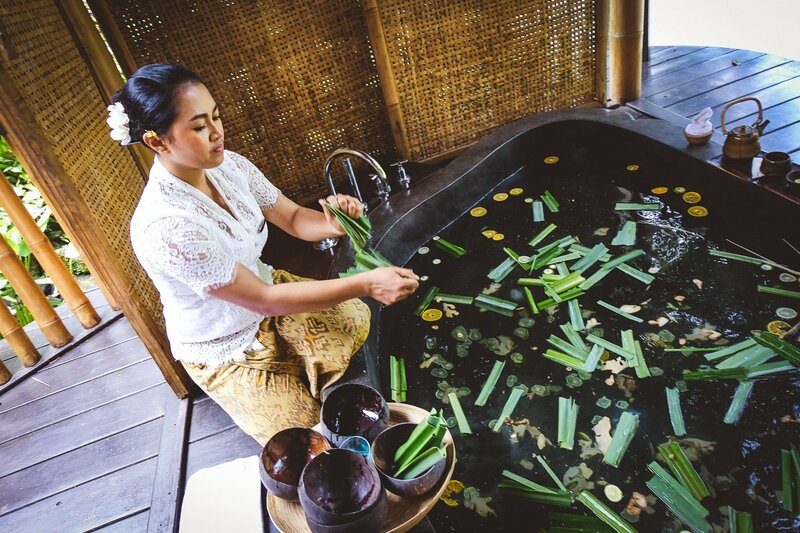 The scrub is then followed by a revitalizing bathing ritual consisting of five powerful healing substances: lemongrass for circulation, Balinese orange and lime provide the essential vitamins, while Pandan leaves and ginger awaken the senses and cleanse your head. 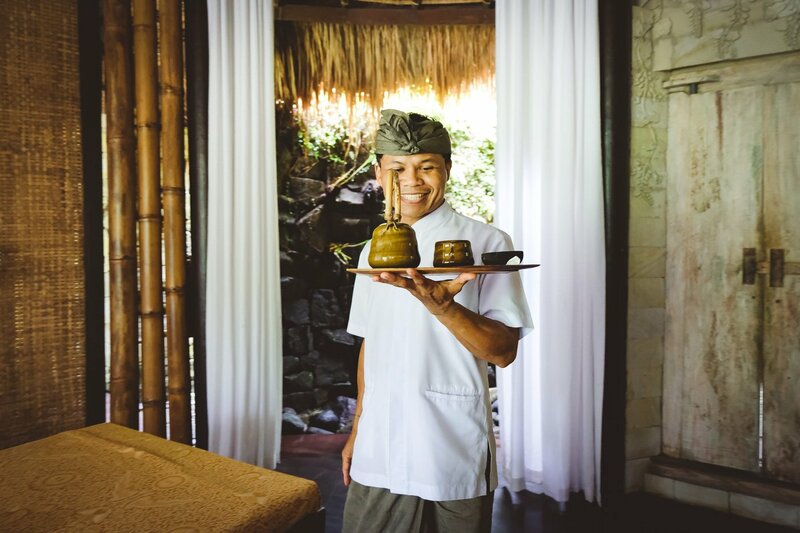 This healing massage is done by Balinese healers and is extraordinary! 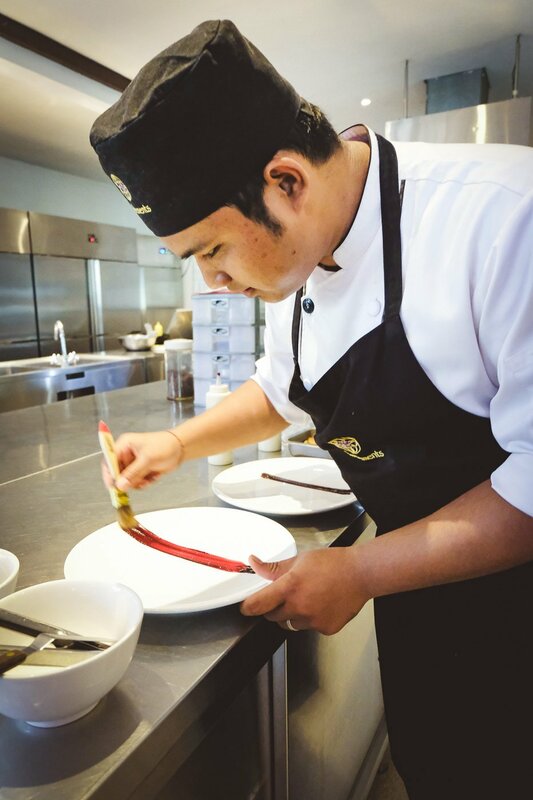 It is based on ancient wisdom passed on from one generation to the next. 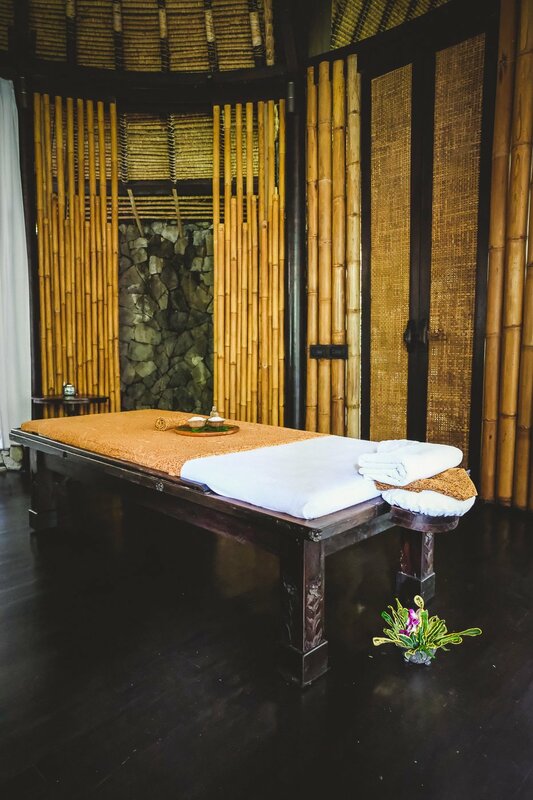 It is a combination of meditation, deep healing reflexology, acupressure and prana energy that is used to cleanse the body of toxins and energy blockages and it improves blood circulation and brings body, mind and soul in balance again. The massage can be painful at times and bruising might even occur, but the results are so worthwhile. I had some very stiff deep muscle tension that Pak Gede released. Really amazing! 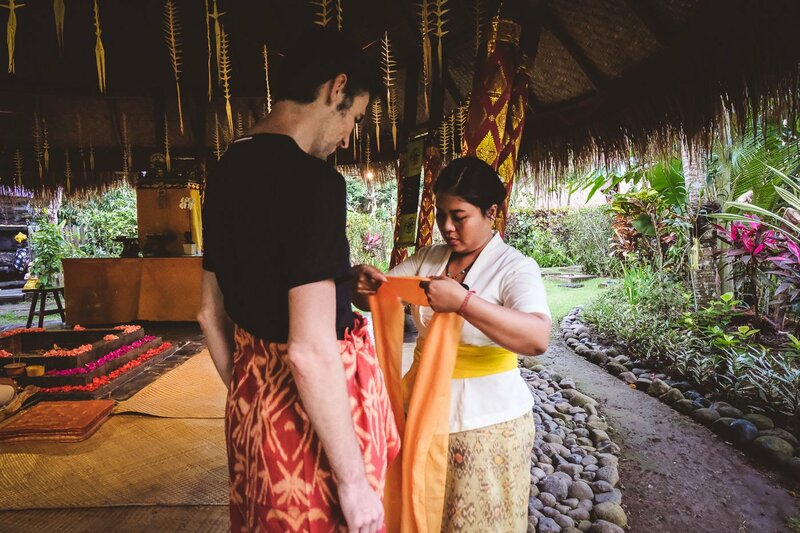 During the Balinese Fire Blessing Ritual, negative thoughts or unwanted energy are offered to the fire to be cleansed and transformed into more positive energy. 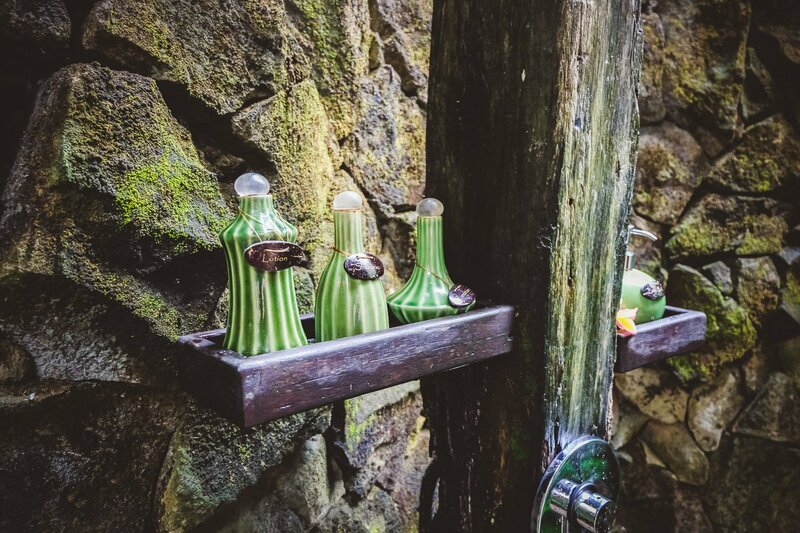 The ritual also helps you to let go of unwanted aspects of your life. 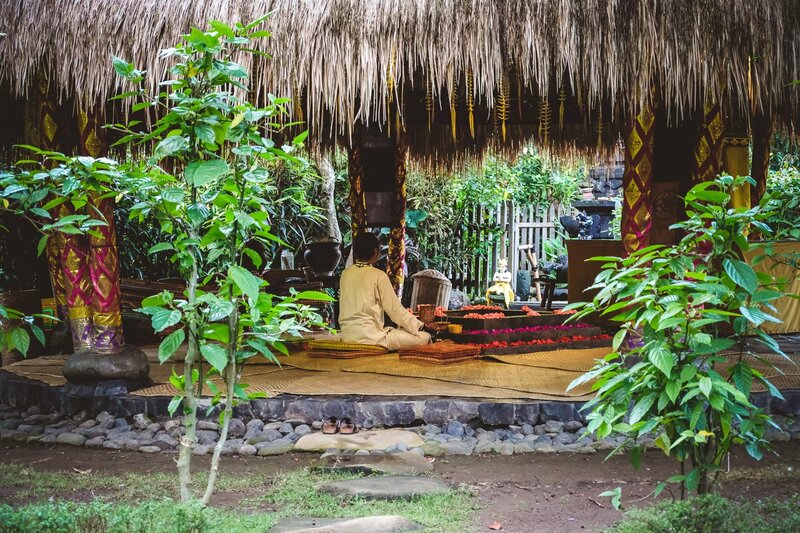 This ancient ritual begins with meditation in the Agni Hotra ceremonial fire space, while you are listening to the hotri or ceremony priest, as he rings the Balinese bell, chants Sanskrit mantras and offers ghee and grains to the fire to evoke the Divine and blessings of health. After lighting the fire, you are invited to make offerings of rice to the fire, the symbol of divine light, and to recite a mantra. The ceremony ends with a silent meditation. We found the Fire Blessing Ritual very moving! 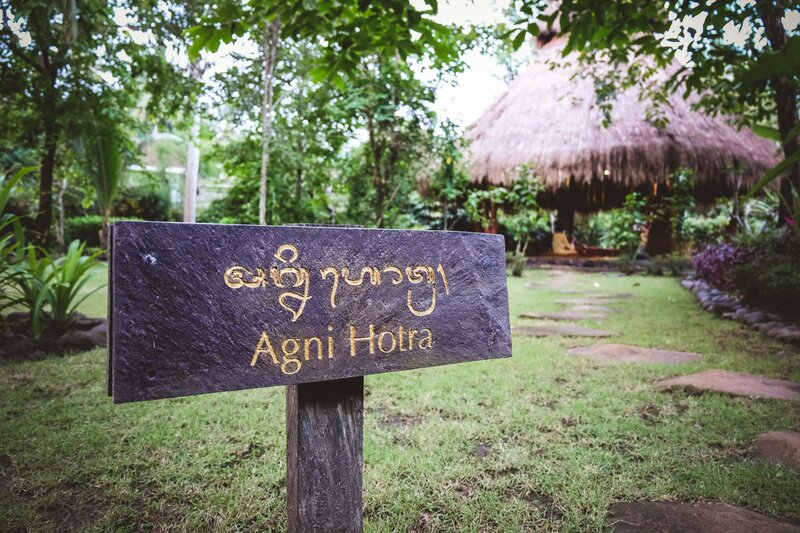 Our tip: Once a month, on the day before full moon, a Full Moon Fire Ceremony – Agni Hotra takes place. 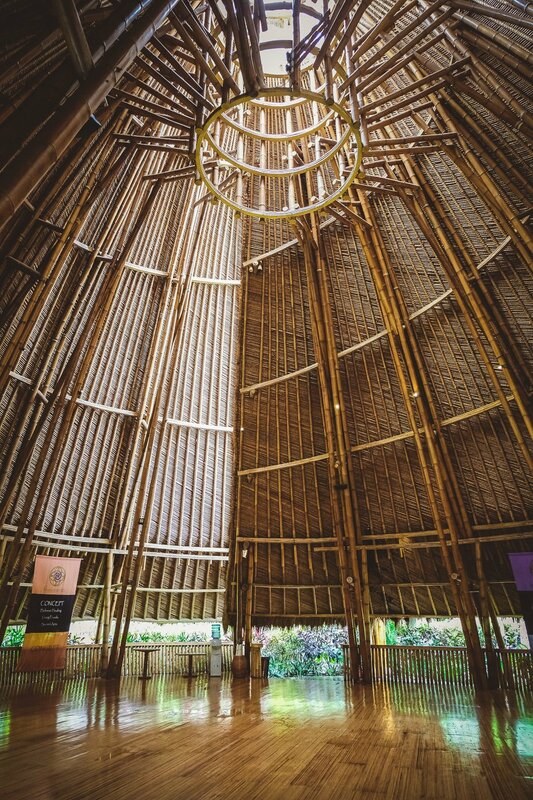 If you are able to schedule your visit around this date, you should definitely do so, to experience this transforming healing ceremony. 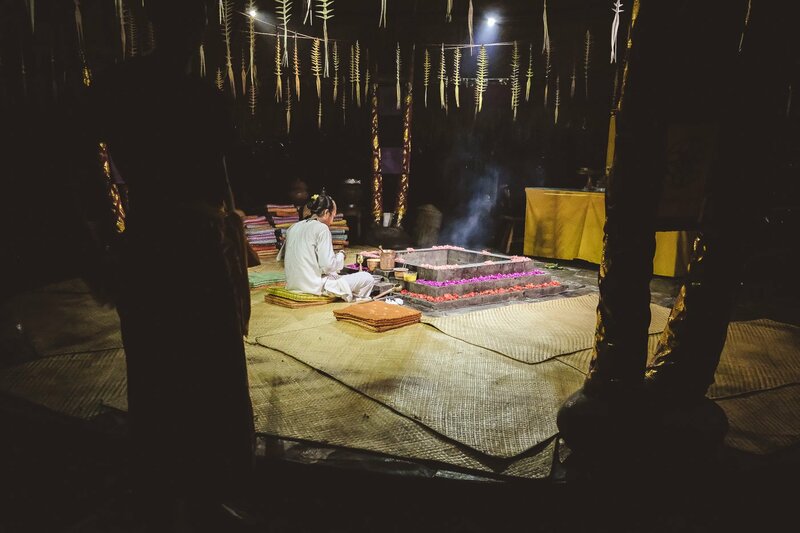 You can also attend The Fire Blessing Ritual without staying at the hotel. 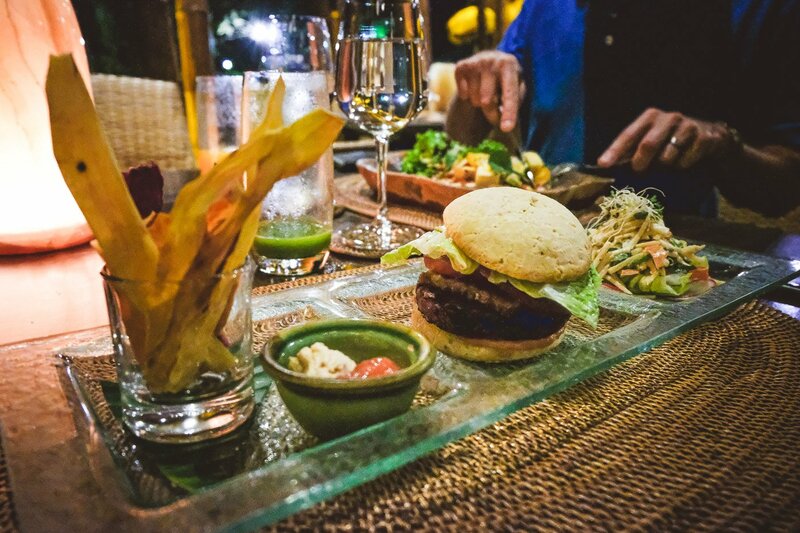 The Fire Blessing Ritual is €22- per person and includes a 3-course Gourmet Chef’s Tasting Dinner. 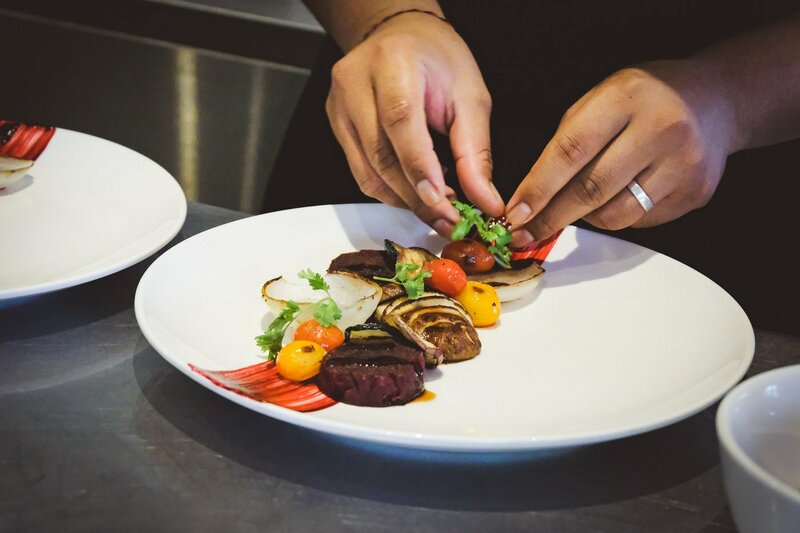 We were allowed to look over Chef Joao’s shoulder while he prepared his amazing vegan art on a plate. 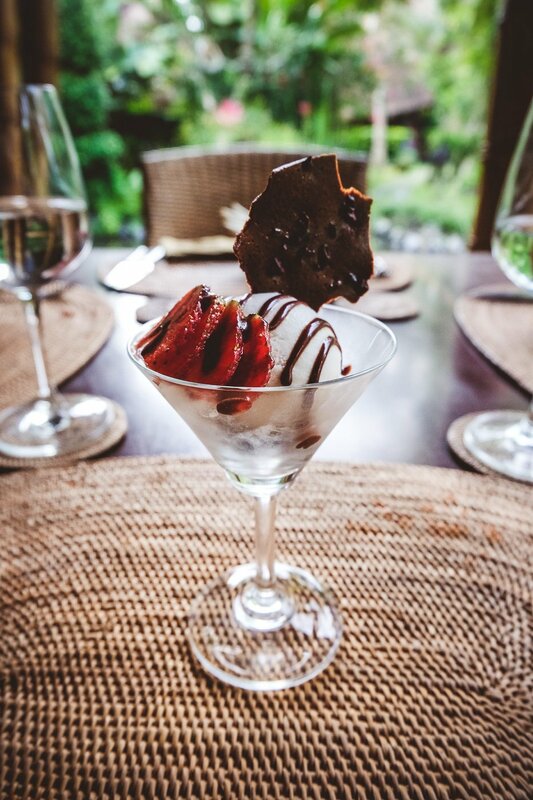 You really have to see and taste it! Exercise plays an important role in well-being. 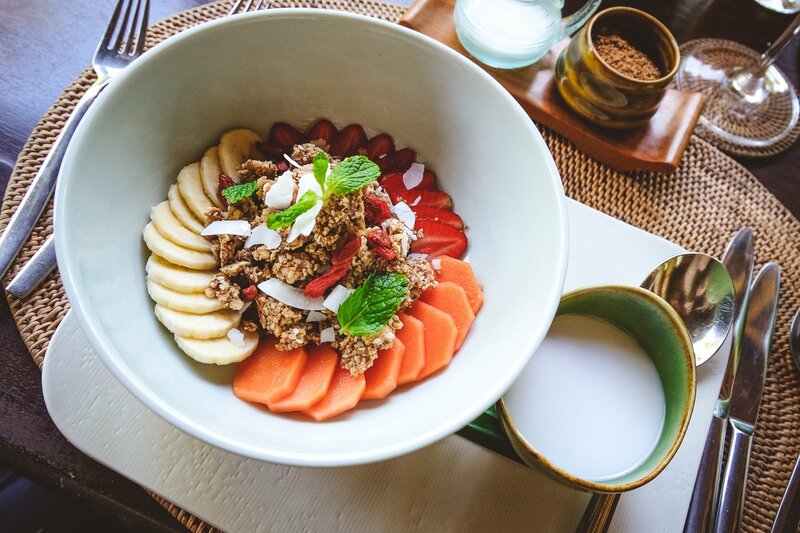 To improve the delicate balance between body and mind, the Fivelements offer yoga, meditation, drama, visual arts, dance, aikido, culinary courses, cleansing ceremonies, blessings and silent retreats to their guests. 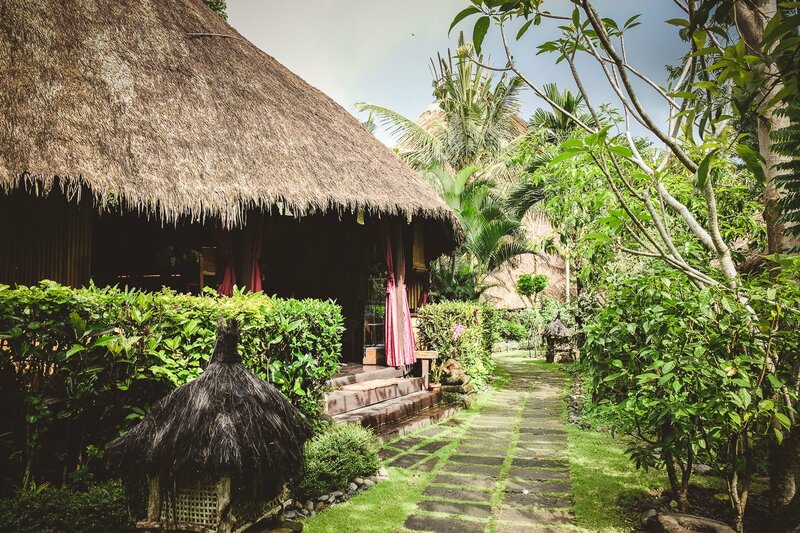 Tantra Healing Yoga, Yin Yoga, Yin & Yang Yoga, Vinyasa Flow, Gentle Hatha Yoga, Ananda Meditation, Sacred Arts Healing, Expressive Arts, Cooking Classes, Nature Walks, Cycling, Beauty and Healing treatments, Healing Journeys, Fire and Water Blessing Rituals are available. 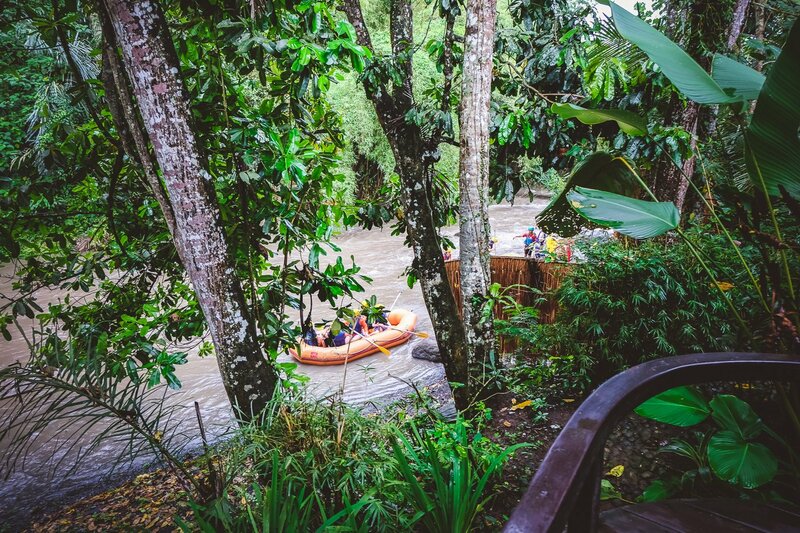 If you feel like being more active: A rafting tour ends directly in front of the suites. 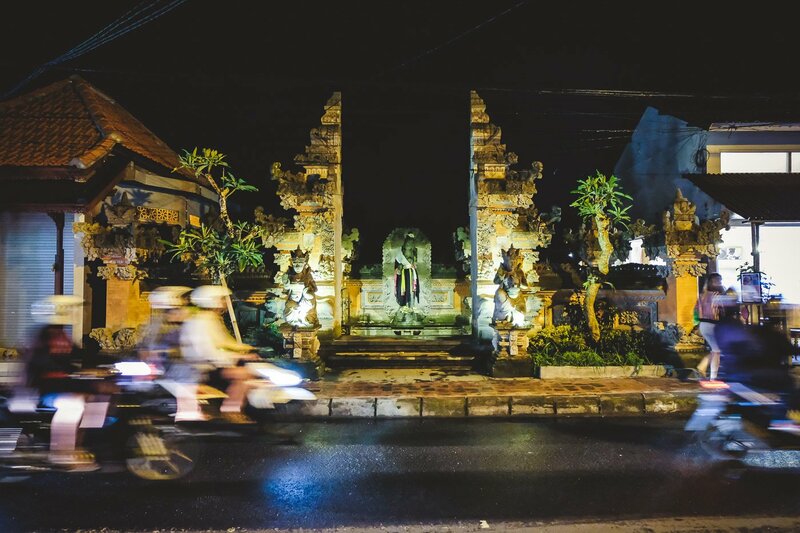 The beautiful and mystical town, Ubud, is definitely worth a visit. 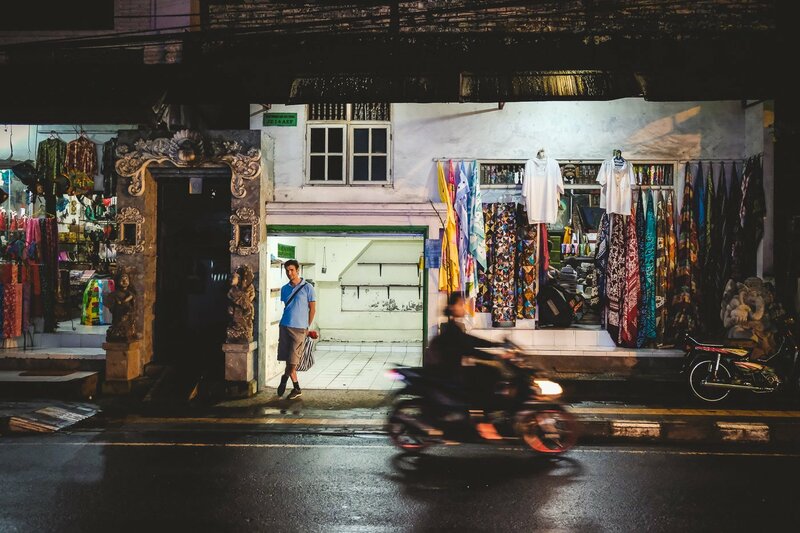 One of the hotel’s drivers will drop you off in town and there are local drivers on nearly every street corner that will gladly take you back. 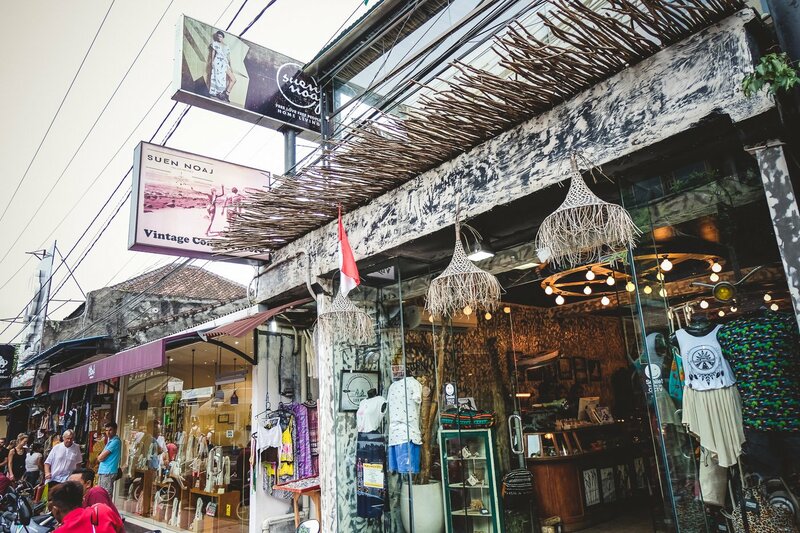 In the heart of Ubud you can do some really nice shopping, experience the local culture, go to the spa and have a bite to eat. I have always wanted to visit the beautiful Fivelements. 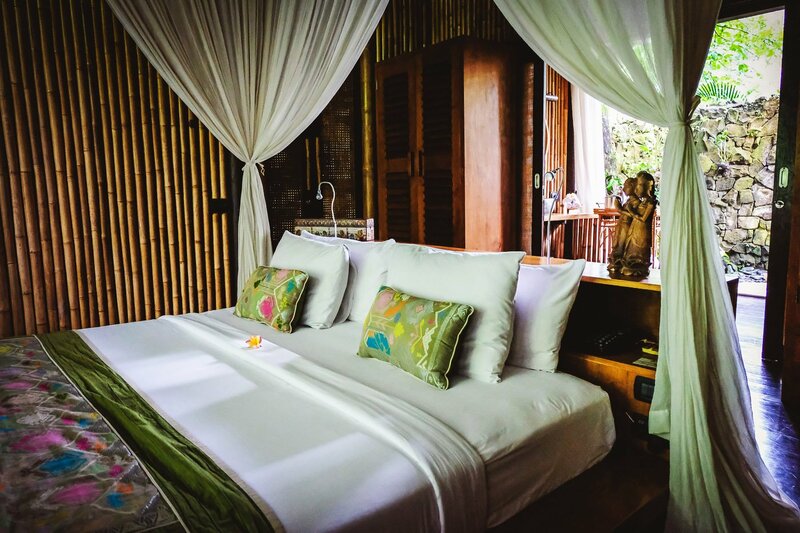 And it exceeded my expectations – it was relaxing and wonderfully romantic! 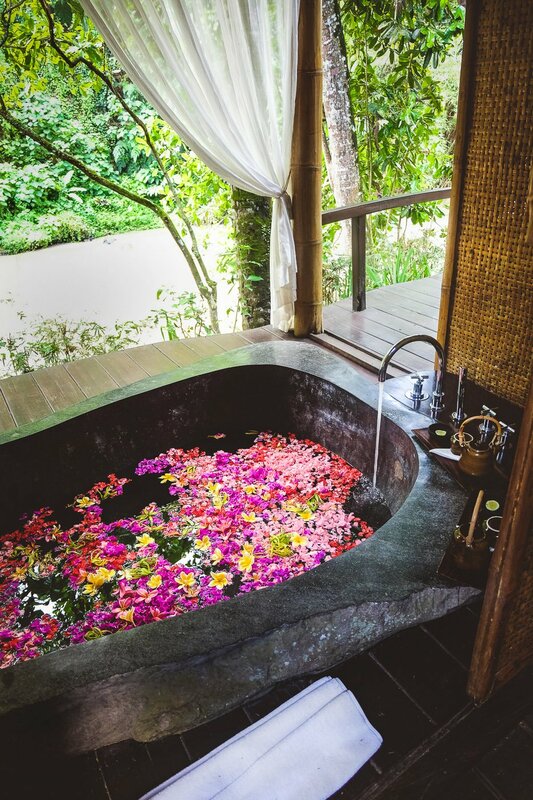 The suites have loads of privacy, the huge bathtub and the great open bath are beautiful. 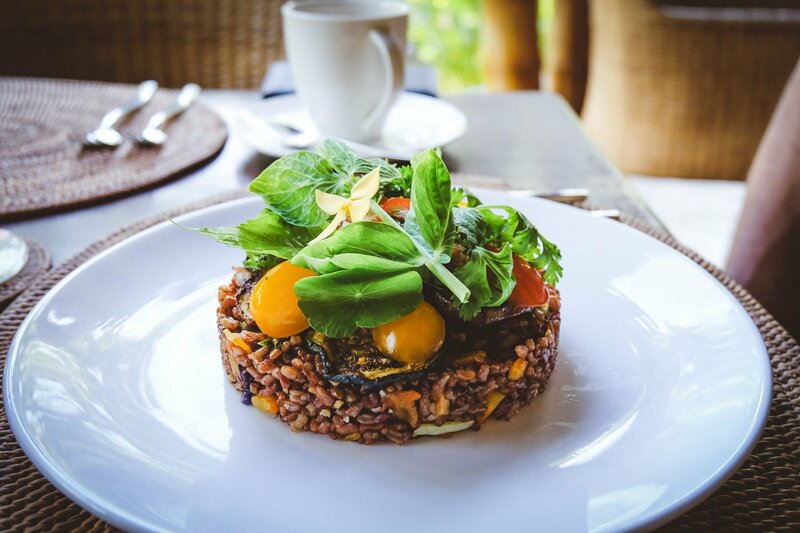 The vegan cuisine was surprisingly more than just delicious and the treatments on offer at the spa are extraordinary and regenerates body, mind and soul. 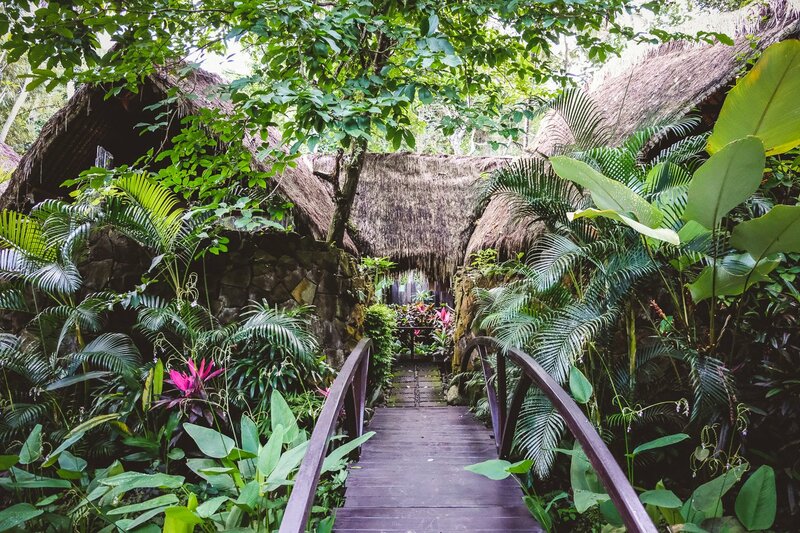 Fivelements is the perfect place to get to know different Balinese rituals, spend some romantic time-out or for your honeymoon. 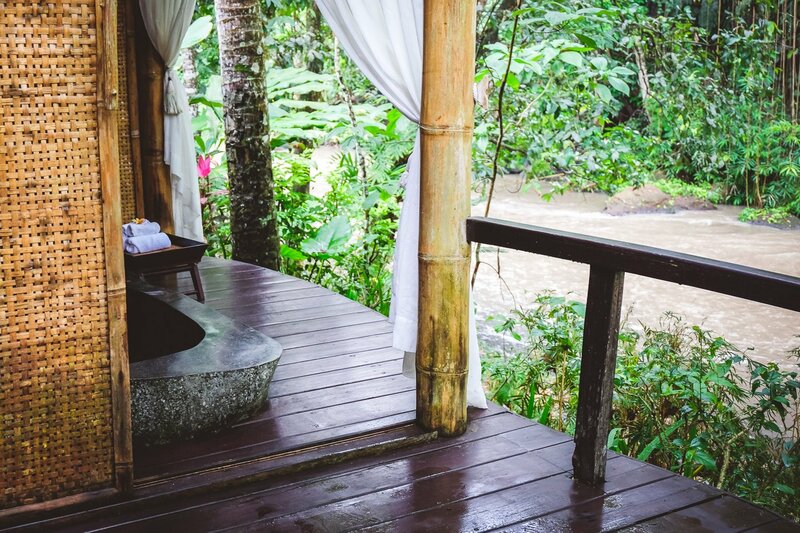 In this serene space surrounded by beautiful nature, you can relax completely, find inner peace and leave everyday life behind. 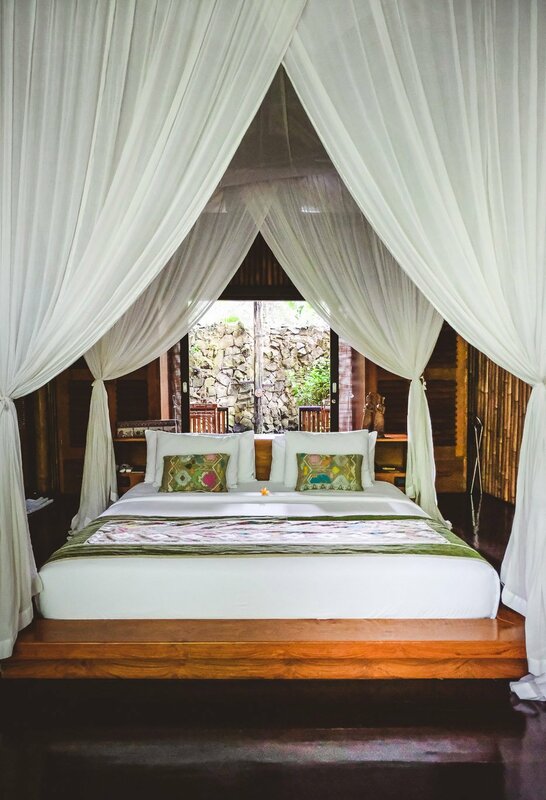 Room: There are nine suites in total, two of them have their own pools: One with one bedroom and the other with two bedrooms. 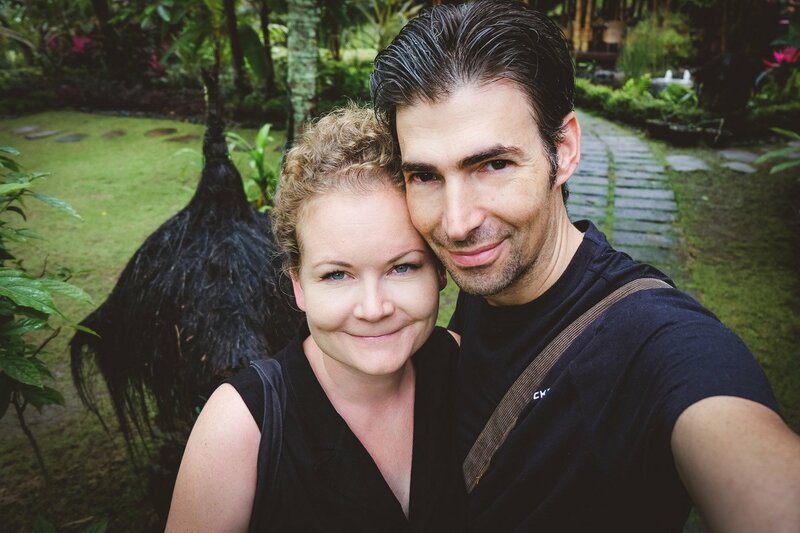 Transfer: About 90 minutes from Denpasar airport, 60 minutes from Seminyak Beach and about 30 minutes from Ubud center. 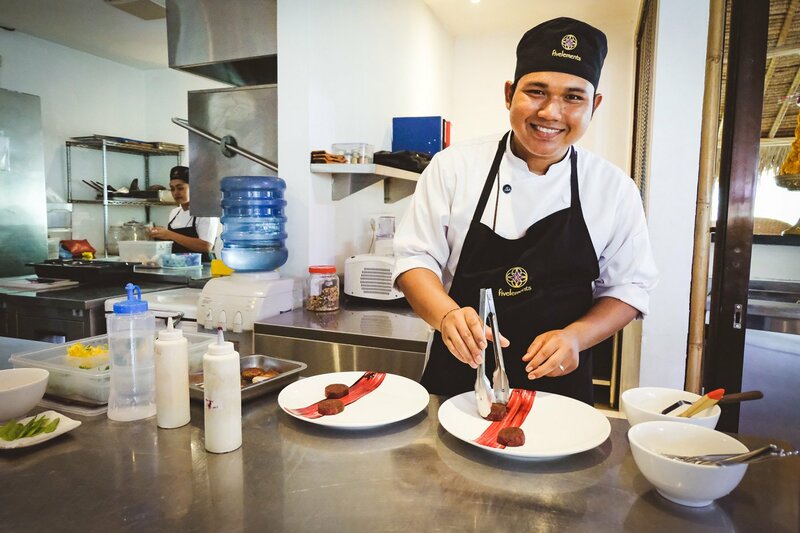 Flight duration: With Emirates from Germany to Denpasar with a stopover in Dubai, for example, the flight time is approximately 15.5 hours. Please note: We funded our stay at Fivelements ourselves. 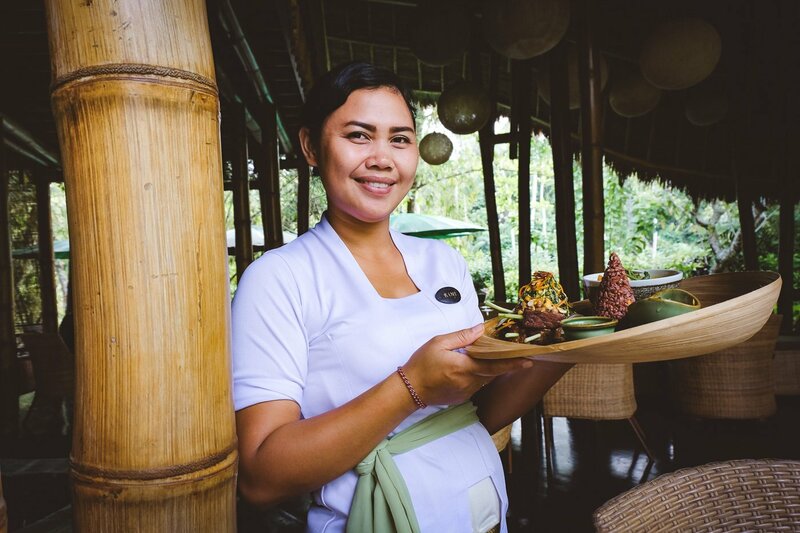 Many thanks for the Sakti ritual, the fire blessing and the Chef’s Lunch!